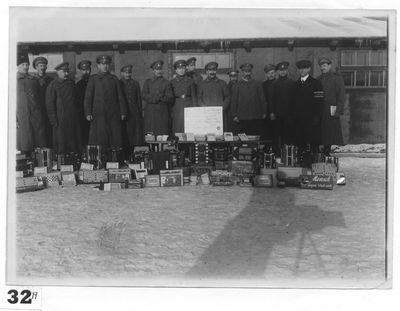 The Russian prisoners in this prison camp display the contents of the recreation chest they just received from the YMCA's War Prisoners' Aid organization in Vienna. Each chest held games (Tambola, dominoes, chess, checkers, and Mensch aergere dich nicht), musical instruments (accordions and harmonicas), books, and Russian Orthodox crosses. An unidentified Association secretary, in the civilian clothing and wearing the C.V.J.M. armband), poses with the Russian prisoners. The YMCA committee in the prison camps then sent these recreation chests to POW's working outside the camp in Arbeitskommandos (labor detachments).